The magnet gun, Father Grigori, and more. The images in this piece were originally posted on Valve Time. We reported on them earlier this year. Junction Point Studios is best known for developing the Wii-exclusive action adventure Epic Mickey. But this wasn’t the first project for the studio founded by Warren Spector after his departure from Ion Storm Austin. Somewhere between the end of 2005 and mid-2007, Junction Point studios worked on an additional Episode for Half-Life 2 that was ultimately cancelled by Valve. In the interceding years, only a handful of details about the Episode have emerged. The Episode would have introduced a new weapon called the 'magnet gun', although it was never explained how the gun worked. In addition, earlier this year, purported images of the project leaked online, depicting what appeared to be the zombie-infested town of Ravenholm carpeted in snow. But whether these environments formed part of Junction Point’s final vision for the project, or to what extent Ravenholm would have appeared in the Episode, was never determined. Now, though, PC Gamer can confirm that not only was Ravenholm to feature in Junction Point’s Episode, but it was to be the focus of the entire game. "We wanted to tell the story of how Ravenholm became what it was in the Half-Life universe. That seemed like an underdeveloped story that fans would really enjoy," says Warren Spector. "In addition to fleshing out the story of Ravenholm, we wanted to see more of Father Grigori and see how he came to be the character he later became in Half-Life 2." Part of the reason little has been revealed about the project is because Spector’s memory of that time is hazy at best. Aside from that Father Grigori would have featured prominently, Spector remembers little else about how the story would have unfolded. 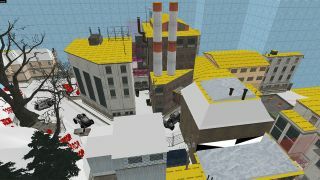 When the images of the Episode were placed online, the map’s content suggested two characters named Duncan and Scooter would accompany the player, but Spector cannot recall them. Indeed, he isn’t even sure whether the player would have assumed the role of Gordon Freeman or played a different character. What Spector can recall, and in considerable detail, is the magnet gun, and how it would have functioned. "If I remember correctly, it was team lead Matt Baer who came up with the idea for the magnet gun," he says. "It went through several iterations, but the one I remember was one where you’d fire a sticky magnetic ball at a surface and anything made of metal would be forcefully attracted to it." The magnet gun was Junction Point’s twist on the gravity gun idea from the original Half-Life 2. Instead of drawing objects into the player’s grasp, it would attract metal objects to a remote location designated by the player via firing the magnetic balls at a surface. Spector cites several colourful examples of how this could have been used. "You could fire it at a wall across an alley from a heavy metal dumpster and wham! The dumpster would fly across the alley and slam into the wall. You can imagine the effect on anything approaching you in the alley – either squashed or blocked. Or you could be fighting two robots and hit one with a magnet ball and they’d slam together making movement or combat impossible for them. Or you could be trying to get across a high-up open space with an I-beam hanging from a cable in the middle. Stand on the I-beam, fire a magnet ball at the far wall, the beam swings across the gap, walk off it, done." Although Half-Life has always been a linear shooter, Half-Life 2's Episode Two expansion experimented with a slightly more open-ended structure, especially toward its conclusion. Meanwhile, Spector’s own games have always been geared toward letting the player explore and interact with the environment in numerous ways. Would we have seen an open world version of Ravenholm in Junction Point’s Episode? Spector says no. Well, mostly no. “We would have followed the Half-Life pattern. Half-Life players had expectations and thwarting them would have been crazy. Having said that, introducing the magnet gun would inevitably have opened up new gameplay possibilities players would likely have exploited in unpredictable ways," he says. This was Junction Point’s rough design pitch for its Half-Life 2 Episode. But how much had Junction Point put into production at the point of cancellation? Spector says it had "put in a solid year" of work into development and had a "small area that demonstrated how the game would look when we were done" in place, alongside a "vertical slice" that showed the magnet gun in action. Spector doesn’t know why Valve decided to ultimately cancel the project. But he describes the news as "frustrating". "We had just figured out how to really use the Source engine, how to get the most out of it and we had just started building what I thought was amazing stuff. And that’s when Valve pulled the plug," he explains. "To this day, I don’t really know why [Valve] decided not to move ahead with the Episode, but they did and, frankly, that worked out okay. If they hadn’t we might not have been available to work on Epic Mickey for Disney," he concludes. "Everything happens for a reason, I guess."